How would influencers save Marks & Spencer? Remember THAT Marks & Spencer jumpsuit that sold out in 24 hours in the summerFirst of all: What is M&S doing right? Well, the retailer must be doing something right, with celebrities and public figures flaunting their statement pieces all over Instagram. Freelance fashion stylist Alexandra Stedman, otherwise known as the Frugality, says there are certain wardrobe staples that she goes to the retailer for: mainly cashmere ("the joggers are fantastic") and "comfortable (but stylish!)" shoes. "But for me, the coat department is the strongest," says the blogger, from London. "I am wearing a faux fur leopard print one from last year right now that sold out almost immediately. "Instagram influencers, like Stedman, have thousands of "followers" on social media and they use this clout to promote products. Sometimes they are paid by retailers to advertise brands. Blogger Debbie Le, of thefashionablepan, says M&S is "definitely going the right way in terms of its diversity and targeting a younger wider audience". "I think them using bloggers and real women of all different shapes, age and size has helped that too," she says. "They're nailing it with their must-have ranges and the fit and quality has been a breath of fresh air. 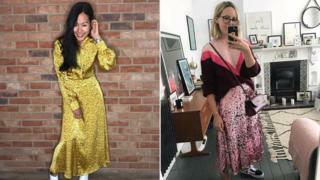 "With the role of influencer of course comes the perks - and Le and her daughter were one of the lucky ones who were gifted the M&S jumpsuit.It caused a "right mayhem" in the summer, she says. Parenting and lifestyle blogger Harriet Shearsmith - of tobyandroo - thinks the retailer needs to diversify more and market an additional message. She has never worked with the brand. "M&S has some beautiful clothes. I think they have a range out there that is suited to far more people than they market to," the 29-year-old from North Yorkshire says. "But they are lacking that additional message. "I don't really see any brand value. I think there is an attitude that it is for older people, for people who have a bit more cash. "I would want to know a bit more about the brand. "River Island's recent campaign about body confidence and positivity is a great example of something she would like to see M&S do. But, you can't please everyone, says Stedman, who has worked with M&S in the past, but is not currently paid by them. "I think the collection is too vast, they're trying to please everyone which just isn't possible with fashion," she says. "I think merchandising in key - I would like to see more of the trend led pieces in the front of the store and not so much bulk of the same trouser style in different leg lengths on one long rail. "In central London, where I shop, this is definitely working. "I think the online shopping experience could be better, too." Stock availability is important too, says Le. "Once they gift something to an influencer they need to back that stock," she says. "Followers trust influencers and they get frustrated when they can't get hold of it. Well I know that's happened with me."